Sister communities, the term coined to describe the villagers that we hold dear to our Forest School movement in Singapore and around the world. Sister communities are the groups and people who are doing similar things as us, and who wish to be part of the movement towards a change in our world in terms of learning and connecting with nature, which is the source of our origin. In this section, we will explore the relationships and work of some of our closer sister communities, whom we have had exchanges with and share many of our insights and stories about our work and challenges together. Being able to have them in our village to raise our children is a privilege. Little Wildflowers, by Karen Quek, is our first sister community that we were connected with. Little Wildflowers does Waldorf-inspired sessions in the parks. I met Karen through an introduction by a parent. We met at MacRitchie reservoir on the morning of a public holiday in 2016. We sat down and had a long chat about what we feel about nature, learning, Waldorf, Forest School and our personal journeys. We were really inspired by each other. In October 2016, I went to volunteer with Little Wildflowers for one session, to understand their ways. Karen carried with her a calming presence for the children. There was a serene sense of delivery to her rituals and stories. The Little Wildflowers children love Karen a lot. She has a gift with children and storytelling. She creates her own stories, how cool is that! (That’s something I’m learning from her every time we chat.) Through 2017, I learnt from Karen that there were moments she felt scared and worried about whether she should continue Little Wildflowers, much like how I felt about Forest School Singapore then. It is scary to be doing something out of the norm. But to realise that we are not alone in this journey together as a connected village is really comforting and inspiring for us. This year, we hope to be able to do more collaborative sessions and even camps with Karen and Little Wildflowers. We share similar beliefs for our children, nature and the cosmic. (Stated on the poster photo on their Facebook site. 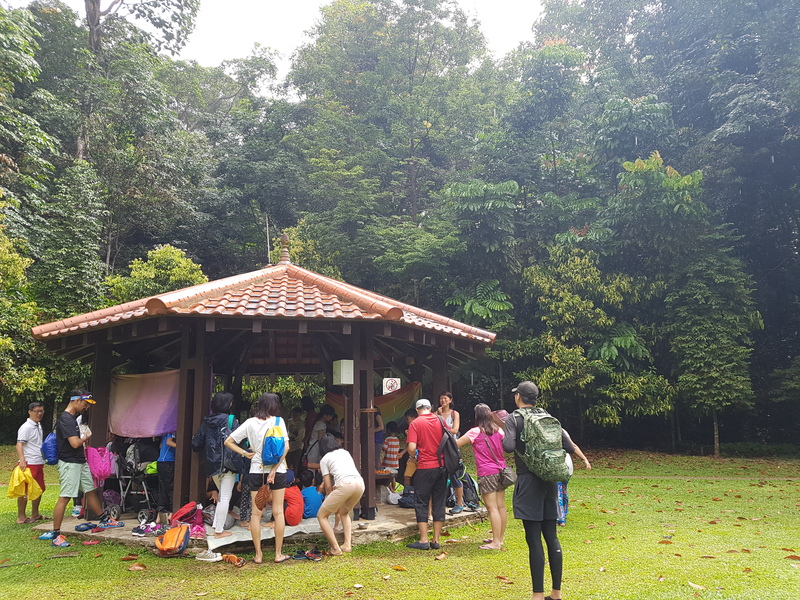 Centre for Nature Literacy and Enterprise (CNLE), by Alexius Yeo, is a set-up with a wealth of knowledge and experience in permaculture and the insight into the science of nature. I got to know them through Alexius when he was featured in Channel News Asia for oddballs in Singapore. Hahaha. We linked up on Facebook, and just like that we met, chatted and became really close comrades in this movement to change the world. Alexius believes in having a new form of economy where nature, community is at the core of the focus. He set up CNLE to educate and inspire others to grow their own food in the urban spaces we have. Last year, he and one of his friends came to attend the Forest School Leadership Training. They are planning to set up their own forest / farm school, for children, in the northern region of Singapore, near their own hometown area. We are in full support of them. Speaking to Alexius and his team has been enriching for me, as they know so much more about the floral and fauna of Singapore. We have learnt a lot from them, and we have plans to send our coaches to learn from them. I foresee us joining together to bring the farming aspect into our children’s lives. To experience our sister communities and their nature programs, do contact them for their classes. We may be small as individuals, but together we can do so much more.